Sheridans offers a yummy recipe of rye crackers, flaxseed and virgin olive oil. 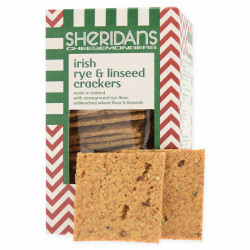 Sheridans offers a yummy recipe of rye crackers, flaxseed and virgin olive oil. These little biscuits are entirely made in Ireland and are perfect to taste with a piece of cheese or chutney. They were quickly overworked and opened a first shop (still in Galway) with cheeses stored up to the ceiling. They become the "Sheridans Cheesemongers". Quickly they combine cheese with other products: olive oil, pâtés, meat ... In 2009, they go further by developing their own products, to their brand: crackers, chutneys and onions marmalade. These are manufactured locally and use quality ingredients. Today, the "Sheridans Cheesmongers" are known and recognized in Ireland. They are at the head of 4 shops and the products of their brand are sold in the finest grocery stores in the country. 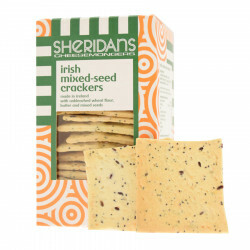 These delicious little crackers are made from irish traditionnal recipes. Ingredients: stoneground rye flour (35%), water, unbleached wheat flour, olive oil, linseeds (2%), sea salt. Allergy advice: see ingredients in bold. Contains gluten. Made in a bakery which also handles nuts. Once opened store in airtight container.